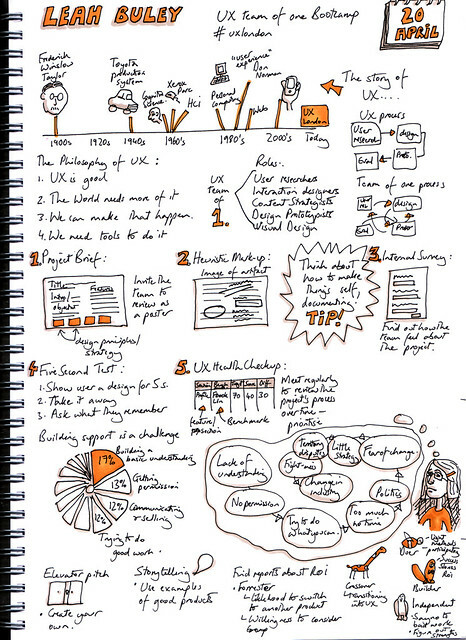 If you’ve attended a UX talk or conference recently, the chances are you will be very familiar with sketchnoting, the art of making visual notes whilst listening to a speaker. Some of the better known sketchnoters are Eva-Lotta Lam and Mike Rhode. I was an avid sketcher as a child and used to spend at least a couple of hours a day sketching, using my family and our pets as subject matter. I studied art as part of my degree at University, but sadly stopped sketching when I started working in the administrative side of the creative industry in the mid-1990’s. I’m not sure why this was, but I guess sketching wasn’t something that was encouraged in the jobs I was doing at that time. And when I started using the internet my new found love of all things digital soon overshadowed pencil and paper. But over the years I have continued to doodle in my notebooks, particularly in boring meetings. Last year I changed my career path and started working in a dedicated user experience role. Because sketching is part of the UX design process, I was keen to improve my sketching confidence and ability. I also organise talks for a local UX group and used to find myself making lots of written notes, which I never referred back to. I was fairly happy with the results but wanted to improve, having seen so many great sketchnotes online. Since the end of last year I’ve learnt a few practical things about how to improve my sketchnotes. I now use a bigger sketchpad (A4) as it makes it easier to fit one talk per page. At first I felt under pressure to limit the text on the page, but now I find that adding notes with images helps me remember the talk better, and also reduces the pressure of producing a page of images. Using a shading pen (e.g. a Promarker warm grey 3 or 4) helps to give people and objects form 3-dimensions. You need to think about how to represent the flow of a talk – this is quite hard to achieve, but over time you get a better feel for it. Using arrows and dividers can help. Coloured Promarkers provide a vibrancy and balance to the sketchnotes but they do tend to soak through paper, so it’s best to put a loose sheet of paper in between the pages to avoid marking the next page. Practise helps. A lot. I attended a very useful session led by Eva-Lotta Lam at UX Camp London on how to draw people. She gave us some useful tips on drawing hands and bodies. But I know I just need to practise more! An important lesson I’ve learned is that if you make mistakes, don’t sweat it! It happens. Just improvise and you’ll find ways to turn them into something that isn’t that discernible to others. For example adding some shadow to cover the mistake. Many of the people in my sketches have ended up with two elbows, or mis-shapen heads, which reminds me of the character Ushikawa in Haruki Murakami’s wonderful trilogy 1Q84. I find that sketching helps me concentrate and process more information. An academic study in 2009 actually provided some evidence for this hypothesis. This hypothesis is further supported by Paivio’s Dual-coding theory, which proposes that it is easier to recall a piece of new information when we process images and words that represent it. In general my ability to recall factual information from memory is not great. I have what people refer to as a visual memory. At school I could recall information I learnt in lessons if I could visualise a doodle I’d made in the margin of my notebook. Unfortunately I got into trouble at school for sketching in the margins of my notebooks. I just wish my teachers had realised the benefits! The actual process of sketchnoting helps me think spontaneously of visual representations for information, which in turn helps cement information in my memory in a way that is easier to recall. 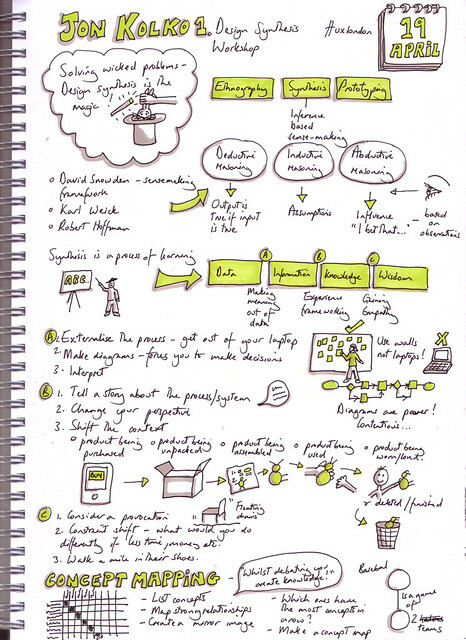 Sketchnotes help me concentrate, absorb and process information and recall it afterwards. If I wasn’t sketchnoting I’d probably drift off, especially when I’m sitting in a full day of talks at a conference. 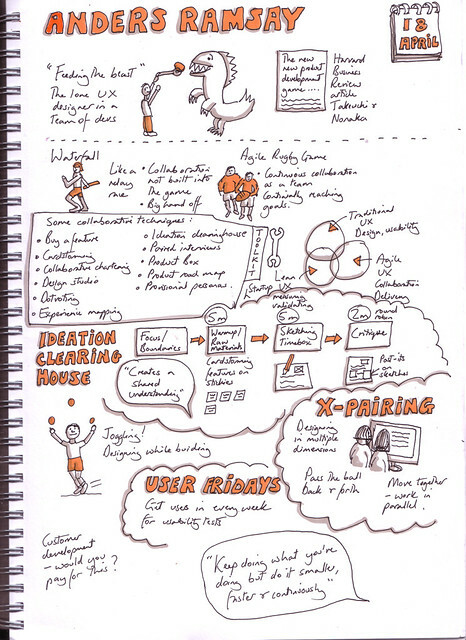 But I also enjoy sharing them and it’s fun to compare sketchnotes with someone else who was at the same talk. You can see loads of inspirational sketchnotes from around the Web on Sketchnote Army, a website set up by Mike Rhode. Thx Michele for sharing, allbe it through Nicky’s FB profile. Lovely to see that something that I teach is actually being used in real life and not just taught in the classroom. Cognitive Psychology actually supports learning through multiple modalities. So you are spot on.